A corona around the sun. Notice how the inside of the ring is blue and the outside is red. In the Arctic, people can sometimes see and hear things that they cannot see or hear most other places on Earth. These phenomena are caused by special atmospheric conditions. Microscopic ice crystals are suspended in the air, changing how light and sound travel over distances. Layers of hot and cold air refract, or bend, light rays. Light bounces off the surfaces of clouds, water, and ice to create optical illusions. People also sometimes report that they can hear noises from much further away in the Arctic. As with optical phenomena, this phenomenon occurs because cold atmospheric conditions bend sound waves differently than the air at lower latitudes. The air near the surface tends to be colder and more dense than air higher up, causing sound waves to tend to bend down toward the surface rather than up away from the earth as they do in more temperate latitudes where air temperature on average decreases with height. The range at which sound can be heard depends on the temperature of the air, the speed and direction of the wind, and the rate at which sound energy is absorbed by the earth's surface. For instance, soft snow absorbs sound energy very efficiently, effectively muting the transmission of sound. In contrast, a hard-crusted snow surface absorbs little energy and a smooth ice surface is an almost ideal reflector of sound. Given the right conditions, conversations can sometimes be heard up to three kilometers (1.88 miles) away. Aurora over the city of Iqaluit in Canada's Nunavut Territory. High-altitude oxygen, about 200 kilometers (124 miles) up, produces rare, all-red auroras, while lower-altitude oxygen, about 60 kilometers (37 miles) up, is the source of the most common auroral color, a bright yellow-green. Blue light comes from ionized nitrogen molecules. The nitrogens also create purplish-red and red colors in the aurora. Also called the northern lights, the spectacular color displays of the aurora borealis appear in the sky on clear, dark nights during periods when solar storms are active. The aurora borealis is centered around the geomagnetic North Pole and is most often seen above the Arctic Circle. However, displays occasionally appear as far south as the northern United States. The same phenomenon occurs in the Southern Hemisphere, known there as the aurora australis or southern lights. Auroras gleam like rainbows or hang like curtains, sometimes seeming to almost touch the ground. But the actual lights are produced high in the sky, 70 to 200 kilometers (43 to 124 miles) above the Earth's surface—far higher than an airplane flies. The amazing color displays and formations are produced by the solar wind, a stream of electrons and protons coming from the sun. The high-energy solar wind collides with oxygen and nitrogen atoms in the upper atmosphere, exciting the gases so that they give of light. Different colors of light result from different gases at different altitudes. 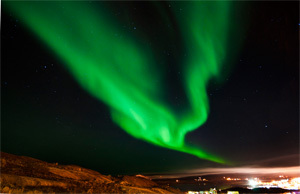 Auroras most commonly appear in green, although red, yellow, and blue auroras occasionally appear. 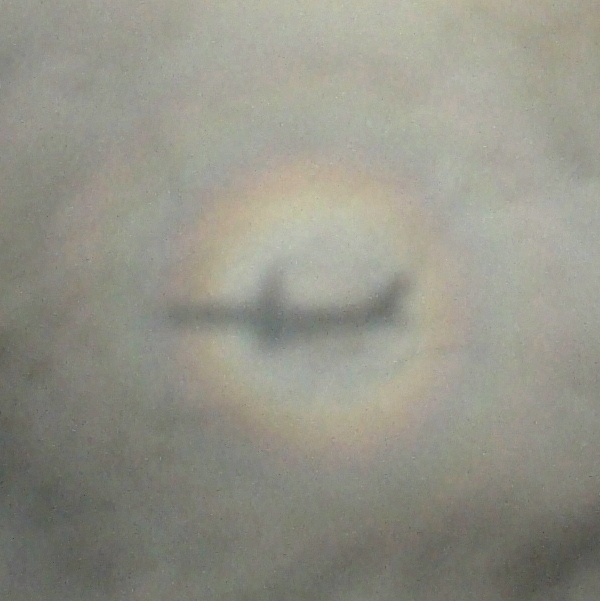 Taken from the air, this photo shows an anticorona around the shadow of the plane. A corona appears as a ring of light that surrounds the sun or the moon, sometimes forming a luminous disk, or even a series of rings with the sun or moon at its center when light is diffracted by water vapor. The image at the top of the page is an example of a corona. Coronas often appear blue on the inside and red on the outside. They are often seen when the sun or moon shines through a diffuse mist or thin clouds, as light waves from the sun or moon get slightly deflected around cloud droplets. 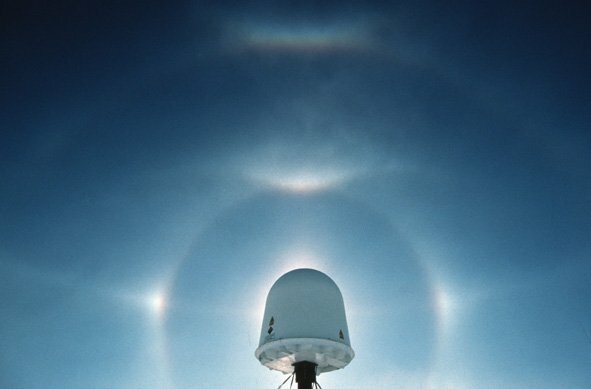 A similar phenomenon, the anticorona or glory, consists of one or more colored rings that appear around the shadow cast by an observer on a cloud or in fog. 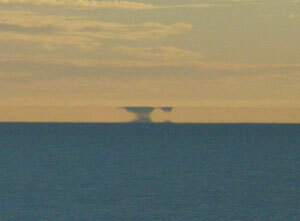 These can sometimes be seen from airplanes. The image to the right shows an example of an anticorona. You can see the shadow the airplane casts inside the colored rings. The red hue of the outer ring is most visible. Water sky refers to the dark appearance of the underside of a cloud layer when it is over a surface of open water. Ice blink refers to a white glare seen on the underside of low clouds. An ice blink indicates the presence of light-reflecting ice which may be too far away to see. 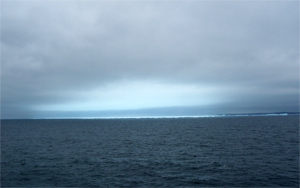 When other means of reconnaissance are not available, travelers in the polar seas can use water sky and ice blink to get a rough idea of ice conditions at a distance. Mirages and other optical illusions occur in the Arctic because of special atmospheric conditions that bend light. A superior mirage occurs when an image of an object appears above the actual object. 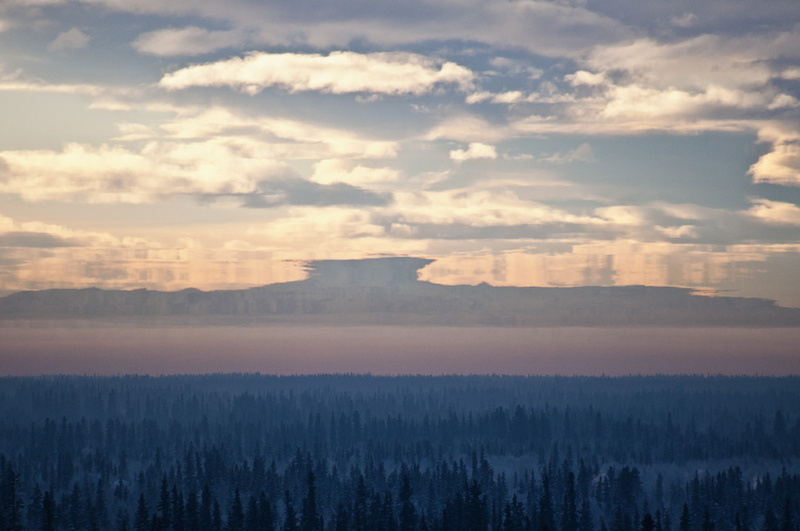 Superior mirages sometimes appear in the Arctic because of the weather condition known as a temperature inversion, where cold air lies close to the ground with warmer air above it. Since cold air is denser than warm air, it bends light towards the eyes of someone standing on the ground, changing how a distant object appears. Superior mirages can produce a few different types of images: Distant objects can appear to float high above their actual position, for example a boat can look like it is floating in the sky, or an object below the horizon can become visible. This is known as a looming type of superior mirage. Superior mirages can also distort images so that the object appears stretched and elevated, called towering. 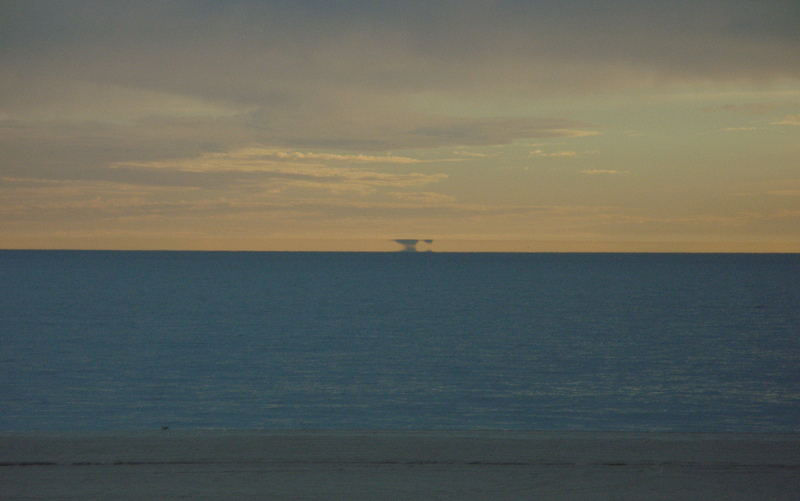 A fata morgana is a complex mirage in which distant objects are distorted as well as elongated vertically. For example, a relatively flat shoreline may appear to have tall cliffs, columns, and pedestals. The phenomenon can also result from temperature inversions. While mirages may seem like fun, they proved confounding for early explorers. In 1818, British explorer John Ross entered Lancaster Sound while seeking the Northwest Passage. He saw mountains blocking the sound, and decided to sail no further. Ross named the range the Croker Mountains—but a later expedition showed that they did not exist: Ross had likely mistaken a superior mirage for a mountain range. In 1906, American explorer Robert E. Peary viewed a vast land northwest of Ellesmere Island and named it Crocker Land after his patron George Crocker. The next decade, American explorer Donald MacMillan and his men traveled laboriously over the frozen ocean toward what appeared to be the snow-capped peaks, hills, and valleys of Crocker Land. But the landscape ahead seemed to change its form and extent over time, and MacMillan realized that he and the members of his expedition were seeing, as Peary had seen, a superior mirage. Also called shimmer, optical haze can work like a fog or mist, blurring objects seen at a distance. Optical haze occurs in a layer of air next to the ground where warmer air flows up and colder air descends, creating wind patterns known as convective currents. The difference in how the warm and cold air refract light causes objects seen though the layer to blur. Optical haze occurs quite frequently in the Arctic, often making it difficult to identify details in the landscape. A halo occurs around the sun when light is refracted as it passes through ice crystals and produces a very well defined ring of light around the sun. This is different from a corona whose ring is created when light is diffracted through small droplets of liquid water in clouds. When a thin uniform cirrostratus cloud deck containing ice crystals covers the sky, the halo may be in the form of a complete circle as seen below in the middle. There are many types of halos. One of special note is the parhelion or "sun dog." Sun dogs are luminous spots on both sides of the sun that occasionally occur with a halo. A fog bow is caused by a process similar to that causing rainbows, but because of the very small size of the water droplets, the fog bow has no colors (right). 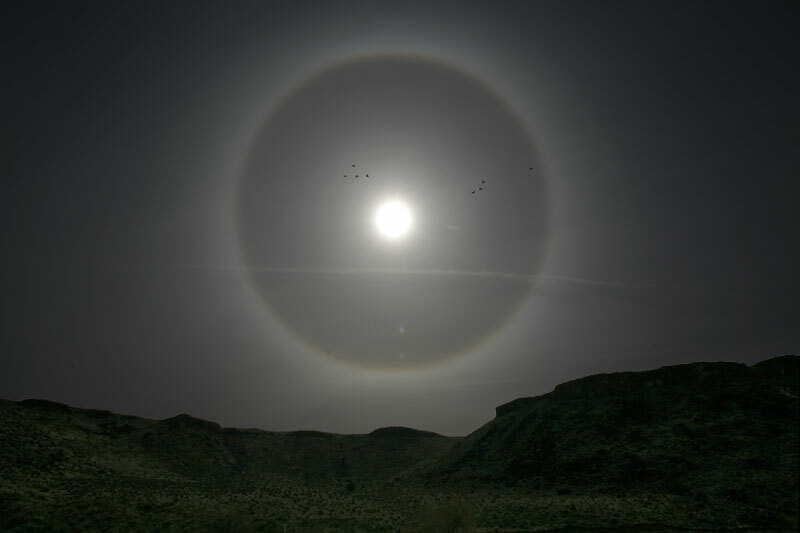 Halo around the sun over Utah. The sun dogs are the bright patches of light to the left, right, and top of the halo. 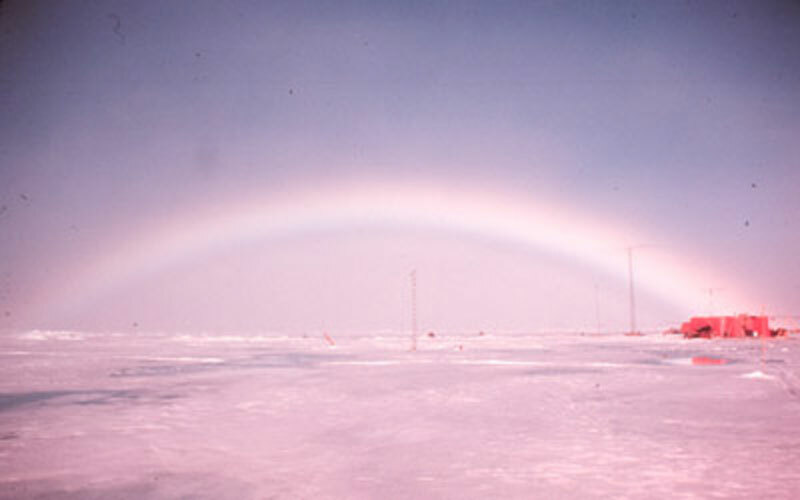 Picture of a "fog bow" taken in August 1958 over melting arctic sea ice. Whiteout occurs when the sky and snow assume a uniform whiteness, making the horizon indistinguishable and eliminating the contrast between visible objects both near and far. The observer loses all sense of perspective, and aircraft and other operations become extremely hazardous. Whiteouts happen most frequently in spring and fall, when the sun is near the horizon. 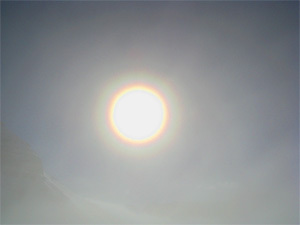 Low clouds or fog and high-albedo surfaces such as snow create whiteout conditions because, under those conditions, light is reflected by multiple surfaces.